We are the logistics for your digital startup! PackAngels provide professional logistics for you. We store, commission and ship your products and take care of returns. So you have time to focus on what’s really important: Sales, marketing and product development – while your logistics are in the best hands. Your goods are safe with us – starting from a single palet bay or 1m² you can start with us. We have space to grow with you! No time to pick products and pack your own parcels! Worry no more – PackAngels are here and take care of it! We work with large freight carriers worldwide and ship your goods within 24 hours of order entry with us. Questions or special requirements? The PackAngels support time is here for you. On request our Angels put stickers on your boxes, tie ribbons or add vouchers and greeting cards to your shipment. Everything under control – your dashboard shows you where your goods and shioments are at any time. PackAngels do for your logistics what business angels do for your funding. Find out how we can increase your capacity and reach. We store, pick & pack and ship your products – cost efficient, fast and safe! Your business plan works better than expected but you still run your logistics from your living room? We offer you space and security – connect your webshop through an interface with our storage facilities and keep an eye on inventory and shipments. Start from a single pallet bay with 1m² and scale up with us! Forget about packing boxes and your daily runs to the post office – we take care of all your orders. 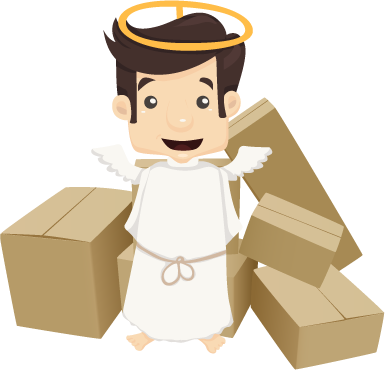 Once your order is processed in your webshop, our Angels get going. We pick & pack into your boxes – on request we add gift wrapping with silk papers or vouchers. We ship national and international and also take care of any returns.